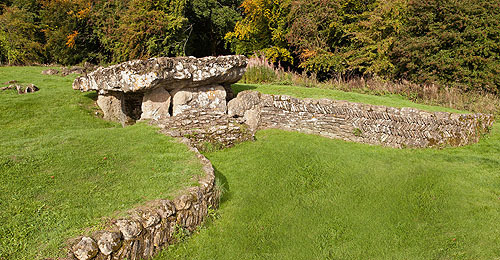 Tinkinswood - Chambered Long Cairn. Tinkinswood ,south of St Nicholas , is close to St Lythans. A Neolithic Long Cairn or Barrow , almost rectangular - 40m by 17.5m and 0.9m high , an ENE-WSW orientation , with a Squat Burial Chamber opening onto a horned forecourt at the ENE end. The Chamber has an enormous capstone - 7.4m x 4.5m (24ft x 15ft) and weighs about 40 tons , it is believed to be the largest in Britain . The herringbone pattern of the drystone masonry indicates the parts restored in 1914, after a thorough excavation - when the remains of 50 bodies were found. Footpath to monument from the lane nearby , which has a few Parking Spaces.